Description: Stock photo of U.S. 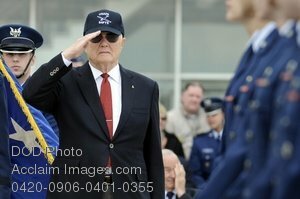 Senator John Glenn saluting the color guard during the noon meal parade April 22 on the U.S Air Force Academy's terrazzo. He was visiting the Academy to be honored as the recipient of the 2008 Thomas D. White National Defense Award. (U.S. Air Force photo/Mike Kaplan). Stock photography by Department of Defense Public Domain.